We departed West Bay with the intention of bringing our Bahamian adventure to a close with our course set for Florida. 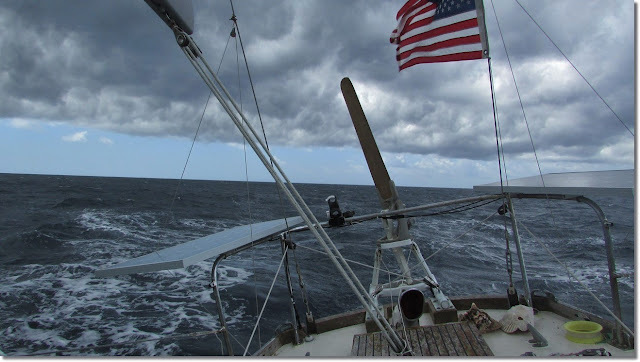 We were headed towards the southern tip of the Bimini chain, a location far enough south to make the Palm Beach Inlet without the gulf stream sweeping us too far north. We had not decided if we were going to stop there or continue overnight towards Florida. The sky was bright, and the sea was a vibrant glassy sapphire blue. Sailing past high altitude rainfall. We were happily sailing along at approximately 25 knots in calm waters towards clear blue sunny skies when I casually looked behind me. The sky was turning black as rapidly moving dark clouds coalesced on the horizon. 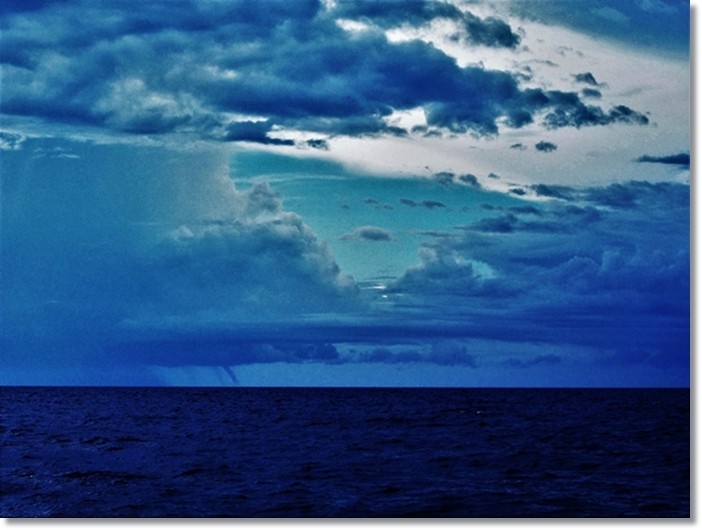 Waterspouts began dropping to the sea. "AJ!" I yelled pointing towards the stern. Then promptly went below to get the off shore life vests while AJ started reefing. When I came back up a wall of darkness was devouring the light. As it encroached on both sides, we found ourselves pointed towards an ever-narrowing window of blue sky. The wind kicked up, we put in another reef and decided to hightail it to the nearest island, Chub key. We made it to Chub in time to anchor before sunset. It was a long windy bouncy night in the unprotected anchorage of a sport fishing club resort island. Unbeknownst to us, it was the first of many stormy nights to come, and our Bahamian adventure was far from over.